Thierry Fischer has made a number of previous recordings for Hyperion, mainly of less familiar French repertoire. However, this is his first venture into the studios with the BBC National Orchestra of Wales, whose Principal Conductor he became in September 2006. To judge by these recordings, made within a matter of weeks of him taking over the orchestra’s podium, the partnership may well turn out to be a fruitful one. I think I’m correct in saying that Psaume XLVII was included in one of his very first concert programmes with the orchestra, in Cardiff on 7 October 2006, along with another gargantuan French piece, Messiaen’s Turangalîla Symphony. I first encountered the two major works on this disc years ago on an EMI LP on which Jean Martinon directed French forces. This was ASD 2892 later reissued on CD as CDC 749748 2. There is at least one other release that couples both of these pieces (on Erato), and other examples of Schmitt’s œuvre, but I haven’t heard those performances. However, it’s hard to imagine either work being better served than is the case in these vivid performances. In 1900 Schmitt was awarded the Prix de Rome and the psalm setting was written in 1904, while he was in Italy, as an ‘envoi de Rome’. One wonders to what extent this was designed as a display piece, showing off his command of the orchestra and also his ability to utilise various musical forms – there’s a short, “mandatory” fugue at the words “Parce que le Seigneur est tres élevé et tres redoubtable” (track 2). The last thing one would call this setting of Psalm 47 (or Psalm 46 in the Catholic psalmody) is restrained. It requires huge orchestral forces as well as organ, a chorus and a solo soprano. It contains some ear splitting climaxes and the brass and percussion sections have a field day. However, it is far from being an unsubtle piece. It plays continuously although there are some clearly defined sections – Hyperion split the work up into four separate tracks. The longest of these, in the middle, is actually the quietest. Only two of the thirty-two lines in the Psalm are set in this section, much of which is characterised by slow, sensuous music, introduced by a languorous passage that features solo violin and bassoon. This is the part of the work that requires the solo soprano, here the Anglo-Swiss singer, Christine Buffle. I can’t recall encountering her before but she impresses with a performance that mixes ardour and sensuality. The role is relatively brief in duration but hugely taxing, requiring the soloist to sing across a very wide range. Miss Buffle seems to me to be equal to all the challenges that Schmitt poses. Either side of this central section are long stretches of full-blooded music in which there is much “grand rhetoric and pulverizing climaxes”, as annotator Calum MacDonald puts it. To be truthful, parts of the piece are excessive – the last few minutes are colossal - but it’s tremendously exciting, especially when the performance carries the conviction and fervour that’s consistently on display here. Fischer and his Welsh forces make a tremendous case for the work and whilst it may not be for everyday listening it’s a marvellous pièce d’occasion. La tragédie de Salomé, which was written three years later, in 1907, is another piece that deploys huge forces, including a wordless female chorus and solo soprano. Surprisingly, however, it originated in a much more economical form: Schmitt’s original version was scored for just twenty instruments – it’s unclear if the vocalists were included in the original scoring. In 1909 Schmitt revised the work into a symphonic suite for large orchestra, excising three of the work’s eight sections. It’s this later version that’s been recorded here. Schmitt’s music was for a ballet scenario devised by the writer Robert d’Humières. This scenario took a different stance to that adopted by Oscar Wilde – and by Richard Strauss in his opera. In the version by d’Humières, Salomé is portrayed as a somewhat innocent girl who is egged on by her mother and doesn’t really appreciate fully what she is doing in dancing before Herod. So there’s no Dance of the Seven Veils here. Salomé dances twice for Herod but when the head of John the Baptist is brought in she recoils in horror and the closing moments of the ballet see her rush, panic stricken, from the stage, pursued by a phantom of the Baptist’s head. Such a vivid scenario was meat and drink to Schmitt and, certainly in the expanded orchestration, he produced a vivid, colourful and at times very powerful score. In the notes Calum MacDonald alludes to Schmitt’s fascination with the music of Muslim countries. He makes this comment a propos the Psalm, and those influences are certainly evident in that work, but actually I hear them even more during certain passages of La tragédie de Salomé. The opening ‘Prélude’, for instance, is a richly atmospheric evocation of a Middle Eastern night. One can almost see the clear, ink black sky with copious numbers of stars twinkling. The plaintive cor anglais solo, followed by other wind instruments, is highly suggestive of the music of the East that fascinated Schmitt. Salomé’s first danse, ‘Danse des perles’, is quite light in character, almost innocent. Here Schmitt suggests a young girl dancing energetically but not necessarily seductively. The Introduction to Part II, which follows, changes the mood, introducing a sense of foreboding. Then the female voices join in during a lengthy section, ‘Les enchantements de la mer’. This is exquisitely scored and though there are some loud passages much of the music is delicate and restrained. During the first four minutes or so I thought there were occasional echoes of Holst – one repeated pair of wind chords sounds uncannily like ‘Venus’ from The Planets! There are also passages that bring to mind Debussy’s Nocturnes. The ladies, when they start to sing, sound just like Sirens, as Schmitt surely intended. The second dance, ‘Danse des éclairs’, begins in a frenzy but very quickly the music becomes sinister and frightening – this is surely when the head of the Baptist is carried in. The final section, ‘Danse de l’effroi’, is not a dance for Herod but a dance of panic as Salomé tries in vain to escape. The very end of the work is uncannily like the end of Strauss’s opera. It’s a graphic tale, illustrated by graphic music. But it’s a work that shows, even in the loudest climaxes, a very skilled orchestrator at work and some of the quieter passages in particular are deeply impressive. The third work on the disc was new to me. Suite dans l’esprit de suite is a much later work and it’s significantly lighter in tone than the rest of the music on the programme. I doubt many people would wish to listen to the whole disc straight through very often but in that event the Suite is cunningly – and necessarily – placed in the middle of the programme where it can refresh the listener’s aural palette. The five movements are inspired by dances. ‘Majeza’ – a word deriving from the aristocracy of eighteenth-century Madrid – makes a light, colourful opener. This is followed by ‘Charmilles’, which Calum MacDonald aptly describes as a “tender yet sumptuous barcarolle”. It is very sensitively played here. Then comes ‘Pécoré de Calabre’, a sprightly Spanish dance, followed by ‘Thrène’. This is a Sarabande of grave beauty, which features some very delicate wind solos. Finally ‘Bronx’ is jazz-influenced, as the title suggests. It brings the suite to a bright and breezy close. This suite is essentially light music but it’s full of charm and it’s deftly scored. The playing that Thierry Fischer secures from his orchestra matches the composer’s deftness. This CD marks a most auspicious debut on CD for the partnership of Thierry Fischer and the BBC NOW. The orchestra’s chorus, trained, I assume, by Adrian Partington, also contribute significantly to the success of the enterprise, singing with finesse where required but not shirking either before the sometimes fearsome demands of Schmitt – the sopranos are regularly sent up into the stratosphere towards the end of the Psalm. Both soloists acquit themselves well. It helps that the performances are caught in sound of demonstration quality – the percussion are thrillingly reported – though the huge dynamic range of the music must have set the engineers some testing problems. Calum MacDonald’s notes are exemplary both in terms of giving information and in conveying his enthusiasm for the music. Calum MacDonald identifies two strains in French music. One is the essentially subtle strain, as exemplified by Ravel, Fauré and others. The contrary strain is one which, as he says, tends towards “the monumental, the Dionysiac, the highly coloured, the exotic and barbaric.” Schmitt, he avers, belongs in the second camp. If you like your French music coloured primarily in subtle pastel shades this disc probably isn’t for you. 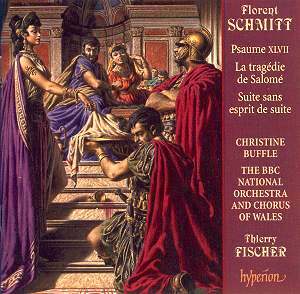 If, however, you can take a touch of the Dionysiac in your musical diet then you should definitely sample this excellent disc.